This test validates handling of the hkern element. 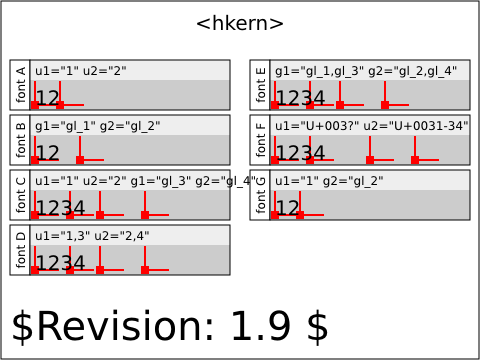 In all instances, a text element matching a font with hkern is displayed along with reference markers showing the expected glyph positioning. The 'fontA' cell shows the string "12" with "fontA" for which there in a kerning pair defined with u1="1" and u2="2". The 'fontB' cell shows the string "12" with "fontB" for which there in a kerning pair defined with g1="gl_1" and g2="gl_2", where "gl_1" has unicode="1" and "gl_2" has unicode="2". The 'fontC' cell shows the string "1234" with "fontC" were the same kerning pair uses u1/u2 to match "12" and g1/g2 to match "34". The 'fontD' cell shows the string "1234" with "fontD" were the same kerning pair uses u1/u2 to match "12" and "34" (u1/u2 are lists of character vales). The 'fontE' cell shows the string "1234" with "fontE" were the same kerning pair uses g1/g2 to match "12" and "34" (g1/g2 are lists of names). The 'fontF' cell shows the string "1234" with "fontF" were the same kerning pair uses u1/u2 to match "12" and "34" (u1/u2 are unicode ranges). 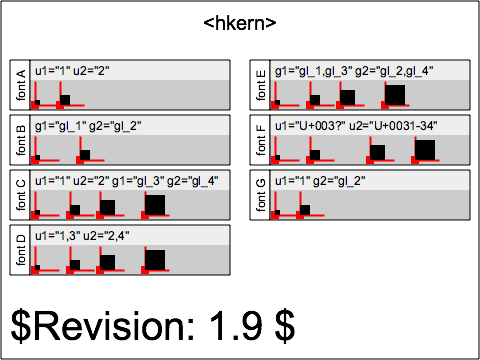 The 'fontG' cell shows the string "12" with "fontG" were for which there is a kerning pair with u1 matching "1" and g2 matching "gl_2".